from the publisher: When we checked the prototypes for Munchkin 7 -- More Good Cards, we found that a typo had crawled into the text on the hang-tab on top. It reads, in all its glory: "56 More Crads For Munchkin!" We could have fixed it, of course. But it wasnâ€™t on a game component. And it was so very stupid that it cracked us up when we saw it. So we saved a bunch of trees and $3,500 by NOT reprinting the boxes. However, we WILL fix it on the next printing. So please, please, please, if you are a compulsive collector, get one of these now, because we WILL NOT print any more on purpose. A munchkin can never have enough good cards . . . so we bring you . . . More Good Cards! In this small but mighty expansion, you'll find the cards that you, yes, YOU, asked for in our online survey. More Wandering Monsters! The best from Munchkin Blender, with new art, along with the brand new . . . And Its Little Friends. More Monster Enhancers! New ways to beef up the critters your opponent is facing. More Cheats! More copies of the classic Cheat!, plus the TRULY abusive Cheat With Both Hands and Cheat Like There's No Tomorrow! More Curses! Don't Call Me Shirley from Blender, and two all-new cards, diabolic and hilarious! More Wishing Rings! Actually, just one. We wouldn't want to spoil too many of those Curses, would we? Plus potions, items, and item enhancers! Shuffle them all in, or just add your favorites. 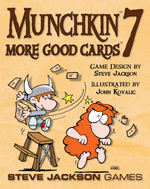 Munchkin 7 â€“ More Good Cards is an expansion for the classic Munchkin set. The last of the Mucnhkin regular atm it is a nice addition. If you already have everything else. This is a great rounding off of your set.